Pool Mate Spa Seal A Leak repairs minor leaks and cracks in your spa or hot tub. Depending on the size of the leak and the number of gallons, it may be necessary to add this Seal A Leak more than once. If the leak location is unknown, add Seal a Leak to the skimmer. If you are sure of the location of the leak, pour Seal a Leak directly into the water at the area of the spa's leak. 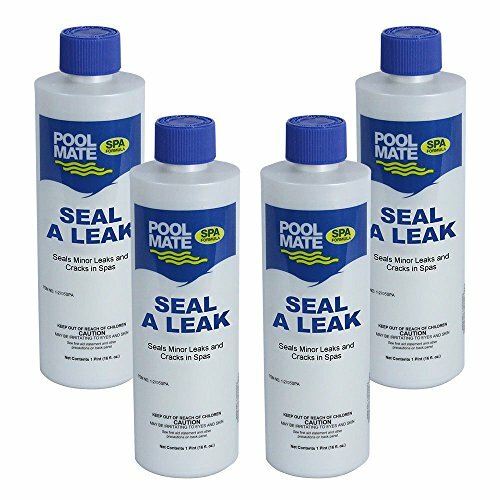 Pool Mate Spa Seal A Leak is recommended for the repair of minor leaks and cracks in spas. Usually stops leaks in 24 hours. DIRECTIONS FOR USE: 1. Turn pump off. REMOVE cartridge or filter grids to avoid product from passing through the filtration system. 2. If the leak location is unknown, add the recommended dosage to the skimmer. If you are sure of the location of the leak, pour the recommended dosage directly into the water at the area of the leak. 3. After 30 minutes following application, turn pump on and all- ow to run for at least 8 hours. 4. Check spa to see if it is still losing water. A second application may be necessary and can be made within the next 24 hours. 5. Replace filter grids or cartridges after 24 hours and resume normal filtration. Spa may be entered 24 hours after application. DOSAGE AMOUNT: 500 Gallons - 1 ounce, 750 Gallons - 1.5 ounces, 1,000 Gallons - 2 ounces. Notes: Remove cartridge or filter grids to avoid product from passing through filtration system. It is possible that fine fountain jets may block when this product is applied.